The Carlotta bedding collection by Croscill is classic in every way. The soft, muted colors of the comforters and accents will bring peace and tranquility to your bedroom. A classic floral pattern featured on a soft ivory background, the Carlotta ensemble will brighten your room without being too overbearing. Beautiful blues, greens, and pinks carry throughout the ensemble. Fun accents like tassels on the Euro sham and throw pillows bring a touch of modern whimsy to the collection. The drapery panels are featured in an ivory jacquard to tie in with the ivory of the comforter. Croscill has been a manufacturer of high quality bedding at an affordable price for over 50 years! The Carlotta Bedding Collection brings the garden into your bedroom with floral sprays on a soft ivory background. The traditional floral pattern with refreshing sky blue accents is sure to bring a sense of peace and serenity to your bedroom! One (1) Queen Comforter, Two (2) Standard Pillow Shams, One (1) Bed skirt 15in drop, Comforter measures 92x96, polyester fabric and poly fiber fill, dry clean recommended, imported. Manufactured by Croscill. 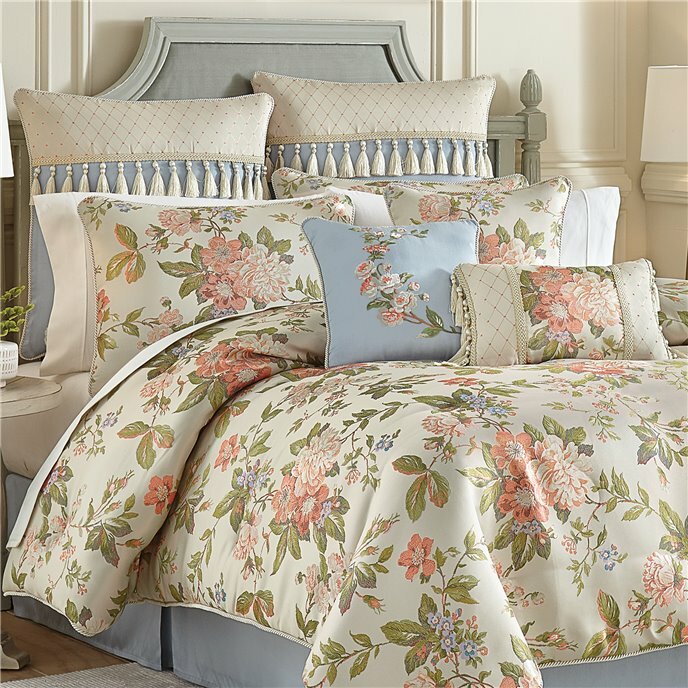 The Carlotta Bedding Collection brings the garden into your bedroom with floral sprays on a soft ivory background. The traditional floral pattern with refreshing sky blue accents is sure to bring a sense of peace and serenity to your bedroom! One (1) Cal King Comforter, Two (2) King Pillow Shams, One (1) Bed skirt 15in drop, Comforter measures 110x96, polyester fabric and poly fiber fill, dry clean recommended, imported. Manufactured by Croscill. The Carlotta Bedding Collection brings the garden into your bedroom with floral sprays on a soft ivory background. The traditional floral pattern with refreshing sky blue accents is sure to bring a sense of peace and serenity to your bedroom! One (1) King Comforter, Two (2) King Pillow Shams, One (1) Bed skirt 15in drop, Comforter measures 110x96, polyester fabric and poly fiber fill, dry clean recommended, imported. Manufactured by Croscill. The Carlotta European Sham features the sky blue colored faux-silk pieced with a diamond jacquard and finished nicely with a gimp and tassel fringe. This sham reverses to the sky blue colored faux-silk and is trimmed with a delicate twist cord. One (1) European Sham, Measures 26x26, polyester fabric, dry clean recommended, imported. Manufactured by Croscill. The Carlotta 18” x 18” Square Pillow features a delicate floral spray on a soft ivory background. This pillow reverses to a diamond jacquard and is trimmed with a delicate twist cord. One (1) Square Pillow, Measures 18x18, polyester fabric and poly fiber fill, spot clean recommended, imported. Manufactured by Croscill. The Carlotta 18” x 12” Boudoir Pillow effortlessly pieces together a lovely floral pattern with a diamond jacquard. This pillow reverses to the diamond jacquard and is trimmed with a delicate gimp and tassel fringe. One (1) Boudoir Pillow, Measures 18x12, polyester fabric and poly fiber fill, spot clean recommended, imported. Manufactured by Croscill. The Carlotta 16” x 16” Fashion Pillow features a lovely floral embroidery on a sky blue colored faux-silk. This pillow reverses to the sky blue colored faux-silk and is trimmed with a delicate twist cord. One (1) Fashion Pillow, Measures 16x16, polyester fabric and poly fiber fill, spot clean Recommended, imported. Manufactured by Croscill. The Carlotta Waterfall Swag Valances features a traditional floral pattern trimmed with a tassel fringe. PLEASE NOTE: A total of three (3) valances were used to achieve the look in the photo. Valances and curtain panel pair each sold separately. One (1) Valance, Measures 54x19, polyester fabric, spot clean Recommended, imported. (Second image shows panels that are sold separately.) Manufactured by Croscill. The Carlotta Curtain Panel Pair features a stunning diamond jacquard with matching tiebacks. Each panel is lined with a solid white polyester lining and include encased weights in the bottom hem. Two (2) Curtain Panels, Two (2) Tiebacks, Measures 41Wx84L per panel, polyester fabric, dry clean recommended, imported. (Second image shows swag valance that is sold separately.) Manufactured by Croscill. The Carlotta Curtain Panel Pair features a stunning diamond jacquard with matching tiebacks. Each panel is lined with a solid white polyester lining and include encased weights in the bottom hem. Two (2) Curtain Panels, Two (2) Tiebacks, Measures 41Wx95L per panel, polyester fabric, dry clean recommended, imported. (Second image shows swag valance that is sold separately.) Manufactured by Croscill.